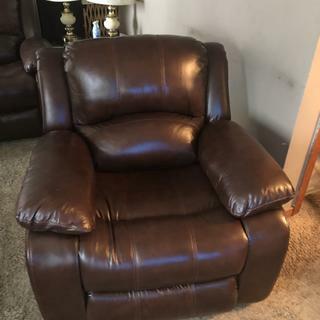 L: 39" x W: 40" x H: 39"
Bryant II Leather Power Recliner Whether it's movie night with friends and family or a relaxing evening at home, this Bryant II leather power recliner is perfect for any occasion. With 100% leather everywhere your body touches and bucket-style seating, this recliner is an attractive blend of style and comfort. Whether it's movie night with friends and family or a relaxing evening at home, this Bryant II leather power recliner is perfect for any occasion. With 100% leather everywhere your body touches and bucket-style seating, this recliner is an attractive blend of style and comfort. L: 39" x W: 40" x H: 39" Width Fully Reclined: 67"
Mortise-and-tenon frame joints are reinforced with dowels, screws and glue for added strength and stability. How long is the Warranty on a power recliner, it's impossible to find it anywhere on R & F site? BEST ANSWER: Hello John! For assistance with warranty information, please contact our customer care at 866.383.4484, option 7. We would be happy to help you!